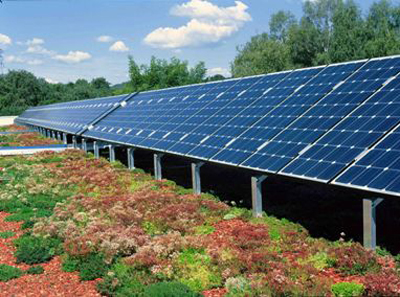 Green roof or photo voltaic cell power panels (PV) on a roof surface – what is the best choice? Some say a green roof, because it insulates better, increases the life span of the roofing material, increases habitat and aesthetic appeal, and retains stormwater (especially if rain water is collected from the roof for reuse as irrigation water, as studied at the University of Central Florida). Others say PV isbetter to put on roofs because it generates energy, and makes the most difference in reducing carbon (some researchers report that PV generates more energy than green roofs insulate). Green roofs in the southwest US require a substantially deeper soil layer, which may be cost-prohibitive from a structural standpoint. Green roofs in arid climates also require irrigation, which then raises other benefit versus impact questions. The University of Arizona is currently studying green roof prototypes for desert environments in hopes of answering some of these questions. In areas of the country where both are appropriate, and the roof can accommodate both, perhaps you don’t have to choose one over another. They are not mutually exclusive, and some claim that they may be mutually beneficial. The efficiency of power produced by PV panels is reduced by .5% for every degree of temperature rise in the panel above 25 degrees Celsius (77 Fahrenheit). 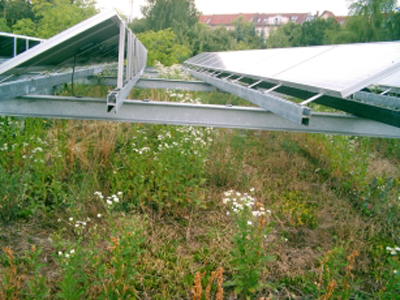 A green roof can improve the performance of roof-mounted PV panels by decreasing the air temperature. According to a web site, Greening California, PV can improve the environment for plant materials by providing intermittent shade through the day. It also mentions that Portland State University (PSU) is conducting a study on the energy performance of PV when it is installed over a green roof, as well as the shading effects of the PV panels on the vegetation. 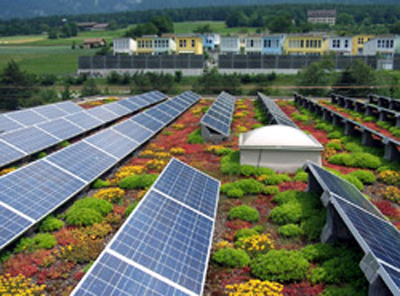 In Germany there are a some examples of a green roof combined with photovoltaics. Does anyone have other examples of combined PV and green roof systems that they could share? Aqui en España despues d haber retirado las ayudas para instalar fotovoltaica,sigue siendo rentable el instalar este tipo de tecnología?Aqui en Gran Canaria donde una cubierta verde seria algo costoso de mantener,que otras alternativas nos queda para instalar algo que ayude al medio ambiente y no nos arruine? Response: Thank you for your commitment to the environment. My hope is that collectively, through demand for products, insistance that governments incentivize cleaner technologies, and investment in research, we can affect positive change. Green roof is such a great concept. 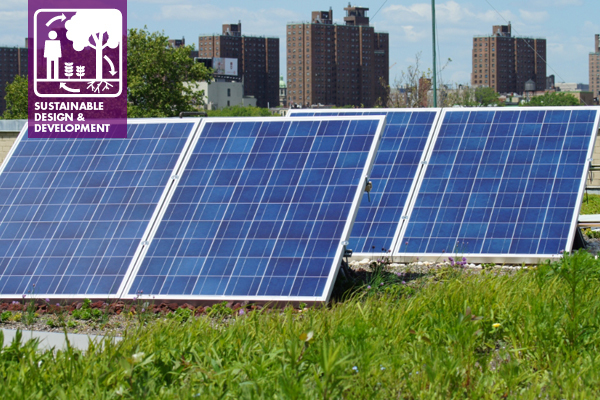 There is no reason we should not be using the square footage on our roofs as solar electric power plants. Every building should generate its own electricity. Water quality is going to become a bigger and bigger issue and if we can use our building to treat water as appose to shedding water that would be great too.